Good Ink is the new book imprint of Pinball Publishing's Scout Books (Portland, Oregon). Its inaugural series, American Shorts, "mines 100 years of the U.S.A.’s literary canon of immortal short stories, from the horrific (“The Fall of the House of Usher”) to the heartwarming (“The Gift of the Magi”), with many stops along the way." 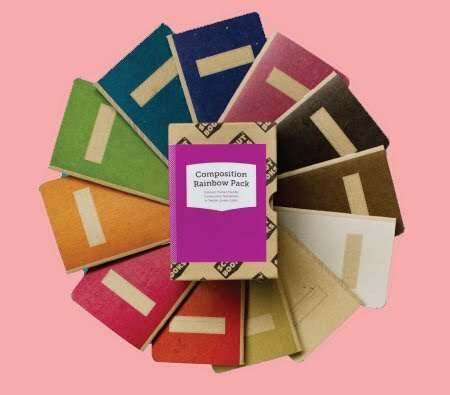 Each of the series' 32-page volumes pairs a classic American author (such as F. Scott Fitzgerald) with a modern illustrator (such as D+Q favorite Vanessa Davis); and all 10 American Shorts come in this cute boxed set complete with a pair of blank notebooks for you to write and illustrate your own classics! Look at how well it looks on our new Scout Books shelf overflowing with notebooks in packs of three or twelve (twelve notebooks, twelve colours)! All Scout Books notebooks are pocket-sized and offset printed with vegetable-based inks on 100% recycled papers. Holler!